I imagine that it'll be a little hard to convince most people that they want to read about Job. He's not exactly a popular guy. It's not because he was bad, wicked or despicable in any way. In fact, he was none of these. But he did suffer a lot in his life and this modern day society doesn't know how to come near anyone who is suffering. We all suffer, of course, and wish other people would come to us and comfort us in our own personal hour of need. Yet when we look around us and see the pain of someone else, we try to subtly stay as far away from them as humanly possible. With that all said, I can't say that I particularly enjoyed reading this particular book in Swindoll's Great Lives Series. It just felt so long and comfortless. Yet, I am glad to have read it as this series really has challenged me in many ways this past year. With each of the books in this series I've walked away with a particular point that was glaring at me after reading the book/reading the scriptural references. When it came to Job the theme throughout the book (for me) was: the need for wise words. I recently read A Way With Words, by Christin Ditchfield (linked to my review) and that book kept coming to mind as I read through Great Lives: Job: A Man of Heroic Endurance . I kept thinking about Job's friends (Bildad, Zophar, Eliphaz, and Elihu). These men really were not good with words. At all. I wouldn't have wanted any of them near me during my own personal trials. Yet there are times when I feel as if I've met one or two of these men and I bet you have too. (And, likely, a time when I've been one or two of these men and I bet you've been the same yourself!) So Job, as much as I dislike wallowing in his grief, I saw as being entirely relevant for today. These four men originally came to Job with good intentions. They originally came to him in his hour of deep sorrow in order to comfort him. When they arrived and saw him, they ripped their clothes in grief and sat down beside him. For one week they didn't say anything to him at all. They saw that his sorrow was great and so they chose to simply be silent and sit with him. Then, after a week of watching him be miserable, they suddenly had had enough. We're/I'm too cowardly to walk up to the person, sit next to them and say, "I'm here when you need me." And if we do work up the courage to say that much, we don't really mean it. They know it and we do also. It just seemed like "the right thing to say at the time." We/I express instant sympathy but then when their problems and pain drags on too long, we walk away and do our best to fill our time and thoughts up with others things so that we can more easily walk away from the problem. Job's friends weren't just content to remain quietly supportive. Sure, they had traveled to see him but the more he lamented his losses the more angry they became at him. In a Carrie paraphrase of what they said to him it would sound something like that, "Job, clearly you've done something wrong. You either don't have enough faith in God or you've sinned against Him in some other stupid way. Repent! Repent! Repent! You are evil and wicked, obviously. You are a bad man or else this wouldn't have happened to you! Repent! Repent! Repent! And in the meantime, stop your sniveling!! We're sick of hearing it!" Nice guys, don'tcha think? But are those guys us - today? I think that's worth some introspection, personally. Pain is mean and nasty. But it visits each of us in different ways and in different times. I think if we're truthful about pain, we would admit that sometimes it not so much the painful circumstances that are getting to us, but the fact that no one else is around to care or help us through it. It's when other people decide we're "too much" that we end up feeling the most hopeless, helpless and alone. Just when Job needed people to come, sit, take care of his and his wife's needs, just listen - they started kicking him when he was down. We like to do that to people. Sometimes we don't know we're doing that but that doesn't make our lack of compassion any less sinful. Grace towards one another is an attribute lacking in today's society. Endurance and - dare I suggest? - well-thought-out words should be the rule but instead are the exception. I've been impressed that I really need to focus more on speaking wisely, well and actually meaning the words that come out of my mouth when it comes to my intentions to help another or have fellowship with them in a "tough spot." That brings me back to A Way With Words, by Ditchfield. It would probably be a good idea for us each to take some time to remember this every now and again, most especially when you see someone knocked down who is struggling to get up again. Accusations and speculations aren't in our realm of responsibility. Faithful compassion and commitment to truth is. You're summary is enough to make us think. 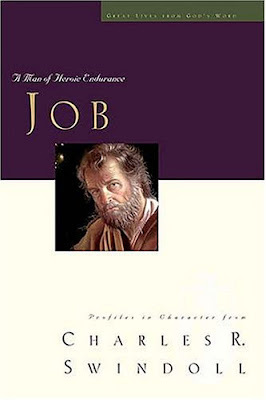 Last year I read Job...and though not the uplifting book that some are, there was still much to learn and take away.